During this school year the SOESD has partnered with REEL (Regional Environmental Education Leaders)to provide one-stop shopping for teachers interested in local environmental resources. 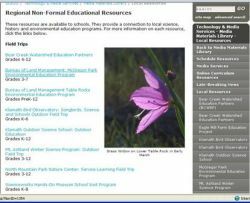 Teachers can now go to one spot to find out information regarding available field trips, resources and classroom visits relating to all types of environmental education agencies. You are part of the “REEL” organization. Who else is part of this organization and what is its purpose? REEL (Regional Environmental Education Leaders) is an informal group of folks involved in non-formal education (Science, cultural history, and environmental education). It consists of non-profit organizations (like Science Works, Klamath Bird Observatory, Jefferson Nature Center, Bear Creek Watershed Education Partners, Eagle Mill Farms), educational institutions (Southern Oregon University), state and city parks (like North Mountain Park), government agencies (like the BLM), and interested private citizens. REEL’S goal is to connect organizations and educators that focus on science and environmental education in Southern Oregon and to coordinate, share resources and collaborate around related educational efforts. We have been in existence since July of 2004. What made you decide to partner with the SOESD? Our group has partnered with the SOESD for a number of years on a variety of projects including trainings on developing school standard based curriculum and surveys that have helped us recognize the needs of local schools. However, the website partnership surfaced when we recognized a need to connect local schools to the resources provided by REEL organizations. I felt that working with SOESD was a win win for all parties involved and was the appropriate organization to serve this information dispersing role. It is an important partnership and I look forward to continuing to develop it in the years to come. Teachers can access these resources by clicking on the “Teachers” link at the top of each page of the SOESD website www.soesd.k12.or.us.